Being forced to fire someone at the workplace can be a difficult task to complete. Along with the emotional aspect that comes with relieving someone of their duties, unfortunately there are some things that must be done in the office to keep it run it smoothly. The employee termination checklist from Microsoft is the perfect tool to assist you if you find yourself in this situation. With the employee termination checklist, you can ensure that there will be no future issues with past employees. Businesses and companies will love the fact that they will also save money by using the employee termination checklist. You can download and print the Microsoft template at no charge. Click the link to get the employee termination checklist. 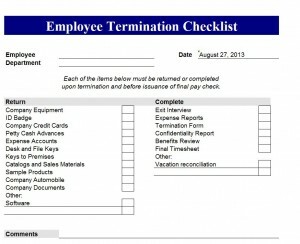 The employee termination checklist is an easy-to-read and use Excel template from Microsoft. The format can be changed in any way that would better suit your needs because the template is totally customizable. However, it provides most of what a company is looking for as designed. Once you open the employee termination checklist, the date will automatically update to the present day. The first step in filling out the employee termination checklist is to add the name of the departed employee as well as their department. The body of the employee termination checklist consists of two categories: Return and Complete. The “return” category is where you will mark off that the former employee has returned company items like equipment, ID badges, company credit cards and keys. The “complete” category is for when you have completed such things as an exit interview, expense reports, termination form and confidentiality report. Make the exit process quick and easy by using the Microsoft employee termination checklist template. Download the Microsoft employee termination checklist instantly for free today!